KANSAS CITY, MISSOURI––January 11, 2019––After an extensive search, Kemper Museum of Contemporary Art has named Sean O’Harrow as its next Executive Director. O’Harrow currently serves as the director of the Honolulu Museum of Art, an AAM-accredited, AAMD-member civic art museum with an encyclopedic collection of over 60,000 objects and a combined full- and part-time staff of a couple hundred museum professionals. While in this position, O’Harrow’s leadership accomplishments have included organizational restructuring that created more collaborative teamwork, more efficient use of resources, and reduction of inefficient expenditures while preserving staff levels and program quality; a greater emphasis on contemporary art exhibitions and programming with a focus on issues relevant to museum audiences; implementation of significant changes in financial management focused on capital expenditure, timeliness, and accuracy; long-range planning and budgeting; the release of $2.2 million in funding from the State of Hawai‘i Grants-in-Aid program toward museum expansion; and raising more funds in a single year than in the museum’s recent history, including the museum’s largest cash gift ever at $4 million. “This year marks a quarter of a century since the Kempers established the museum, and I feel most fortunate and honored to be chosen as Executive Director on this auspicious anniversary,” stated O’Harrow. “The world is dynamic, diverse, interconnected, and ever-changing, and Kemper Museum of Contemporary Art is precisely the right institution to lead Kansas City and the nation forward in exploring how contemporary art can foster understanding of relevant issues and the world around us for another exciting twenty-five years and beyond." Born in Paris, France, and raised in Honolulu, Hawai’i, of parents from the midwestern United States and Vietnam, O’Harrow was appointed director of the Honolulu Museum of Art in late 2016. Prior to this return to his hometown in Hawai’i, he was director of the University of Iowa Museum of Art and a member of the Iowa Arts Council Board of Directors. While at the university, he organized a worldwide tour of the work of American Abstract Expressionist artists, featuring Jackson Pollock’s Mural––his first commission from Peggy Guggenheim, considered the “genesis” of Modern American art. More recently, this work was exhibited in Kansas City at The Nelson-Atkins Museum of Art to great acclaim. Before arriving at the University of Iowa, O’Harrow led the Figge Art Museum in Davenport, Iowa, after serving as an Official Fellow of St. Catharine's College in the University of Cambridge. He received his AB from Harvard University and his PhD from the University of Cambridge, both in Art History. 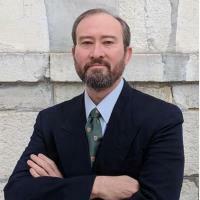 He has received numerous academic awards and grants, including from the Pulitzer and Ford foundations in the United States, as well as the British Academy in the United Kingdom. In order to learn about the "real" world, as O'Harrow puts it, he also spent several years as an executive in the world of hedge funds and technology finance in London. O’Harrow will begin his duties as Executive Director of Kemper Museum of Contemporary Art on Monday, February 11, 2019. Support for Kemper Museum is generously provided by members and donors. Kemper Museum of Contemporary Art is open 10:00 a.m.– 4:00 p.m., Tuesday–Wednesday; 10:00 a.m.–9:00 p.m., Thursday and Friday; and 10:00 a.m.–4:00 p.m., Saturday and Sunday. All exhibitions and public programs at Kemper Museum are free. Kansas City’s renowned FREE contemporary art museum, Kemper Museum of Contemporary Art opened in October 1994 and draws 100,000 visitors each year. The Museum boasts a growing Permanent Collection that uniquely bridges modern and contemporary works of art featuring artists such as Louise Bourgeois, Barbara Chase-Riboud, Keltie Ferris, Helen Frankenthaler, Hans Hofmann, Rashid Johnson, Joan Mitchell, Richard Mosse, Georgia O’Keeffe, and Ursula von Rydingsvard. Special exhibitions, installations, lectures, and workshops, as well as youth, teen, and family programs are regularly hosted at the Museum. For more information about Kemper Museum of Contemporary Art visit kemperart.org. Sean O’Harrow, 2019, at the Musée de Basse Navarre in Saint Palais, France.